Getting There: Brussels International Airport is served from the U.S. by direct flights from Atlanta, Boston, Chicago, Cincinnati, Las Vegas, Los Angeles, Miami, New York, Oakland, Orlando and Washington, D.C. on American, City Bird, Delta, Sabena, and United airlines. The 1-800 telephone numbers and Web links for these airlines are listed on this magazine's Airlines page. Transportation to Brussels, an eight mile drive, is available by taxis or train shuttles. If you plan on driving, rental cars should be reserved ahead. to obtain the best pricing. Auto rental companies include Hertz, Avis, and Europe-By-Car. The 1-800 telephone numbers and Web links for these and other auto rental companies are listed on this magazine's Autos page. Train tickets can be reserved through Rail Europe (1-800-438-7275). Rail passes such as Eurostar, Thalys, Eurail, and National are also available. For ferry information call (212) 758-8130, or visit the Belgian Tourist Office Web site, listed below. Staying There: Brussels hotels offer special weekend and summer rates. Several Belgian hotels offer special packages. For last minutes reservations, visit local city tourist offices. 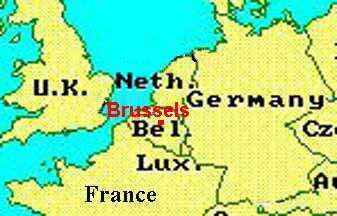 The Brussels Tourist Office telephone number in-country is 32-2-513-8940, fax at 32-2-514-4538. Complete information on Brussels and Belgium, including accommodations and upcoming events, is available in the US from the Belgian Tourist Office, 780 Third Ave., Suite 1501, New York, N.Y., (212) 758-8130, e-mail at info@visitbelgium.com or belinfo@nyxfer.blythe.org. The Belgian Tourist Office Web site is listed below. Useful travel publications are Fodor's Belgium and Luxembourg and Frommer's Belgium, Holland and Luxembourg, available in the Book Store. Fast Facts: Brussels, the capital of Belgium, is a cosmopolitan city of about a million people that serves as a center for tourism, national government, and international commerce. The city and its people have survived centuries of wars and occupation. Much of its personality is reflected in the architecture and life near the Grand-Place, one of the world's most beautiful squares. Belgian Tourist Office Welcome to Belgium, with introductory info, accommodations, caldendars, etc.